We waited all summer, until the weather cooled, to begin the second phase of the restoration. 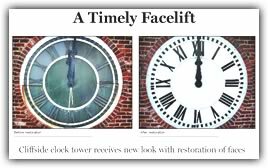 Initially we had intended to restore just the clock faces; then we realized the entire tower needed a cleanup. We scheduled the work for the week of Sept. 25, hoping the weather would cooperate. It did. In the ensuing weeks, the crew at Albemarle Glass worked their magic removing the old paint and corrosion from the cast iron frames, then they repainted them. Carefully, they took measurements and made a pattern for each of the 16 iron quadrants, to follow in cutting the milk glass. 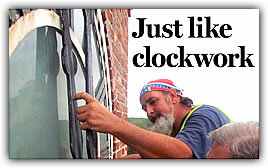 On Oct. 18, the glass men returned with all the elements to make the clock whole again. It was a long day, lasting until nearly “can’t see,” but it was worth it. In the next day’s sunlight, the old tower glistened, and the pure white milk glass was stunning. The clock has never looked so beautiful.